With the popularity of mobile applications increasing, more and more people are looking for an easy way to create an online home for their software. MyApp was created to make it easy to publish and promote your app, and has been tailored specifically for the mobile market. 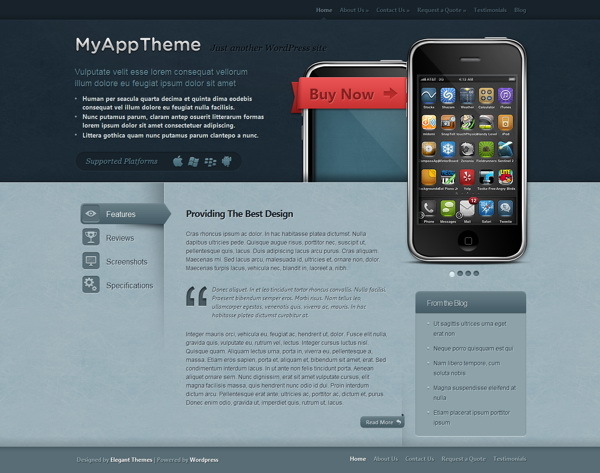 This special wordpress theme is designed to quickly and easily setup a product page for your iPhone application – no matter if it is offered for free or sold trough the iTunes AppStore. Of course, although the default design is targeted at iPhone or iPod touch applications, you can also quickly and easily modify it to present Windows Phone 7 applications or Android OS applications. MyApp comes with four different color variations. If Blue isn’t your style, then try switching to the Green, Purple, or Black color schemes. Even though MyApp was created to be a CMS with a Page-Based structure, you can also run the theme like a normal blog instead. This theme utilizes timthumb to automatically resize your thumbnail images. Because of this, only one thumbnail images is required per post, despite the various thumbnail sizes used in the theme. With MyApp you can place 125×125 banner images in your sidebar and 468×60 ads to your post pages with ease. Advertisements are handled from within wp-admin, and can be turned on and off at any time.